If your yard, garden, or green space could use something more, don’t let potential landscaping labor deter you. While adding gardens, planting trees, and mowing grass can be tedious, hardscapes can provide a bit of polish without the back-breaking work. Make some solid improvements in your landscaping with hardscapes! Bring a sense of symmetry to your green space with curbs, edging, and borders; creating concrete lines around your beds and features will help them stand out while also lending a sensible order and panache to your entire property. 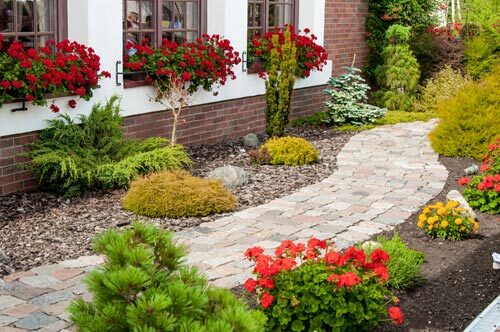 Paved borders are easy to maintain, and they help tame wild foliage and contain garden beds. 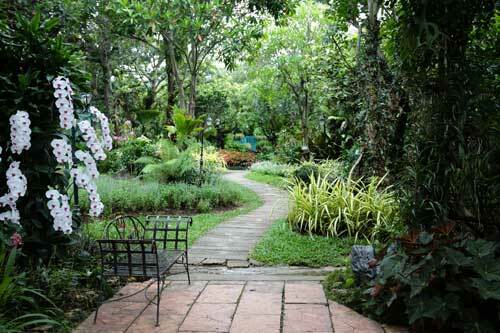 Hardscaping makes good sense for areas where people will be walking and using the property. For instance, pave your paths and walkways to reduce the risk of someone taking a nasty fall. Paved paths and walkways are comfortable to walk on, and these features add a polished touch to the home’s overall curb appeal. Save yourself a lot of time pushing a mower with hardscaped patios and decks. These fixtures can break up a large or unruly lawn and makes an excellent focal point for smaller outdoor spaces. A cement patio or pad in the middle of your yard is ideal for lounging and entertaining and requires a lot less care and maintenance than foliage, plants, or grass. Create a clever configuration that features built-in furnishings for conversation spots and a place to sit. You can create bench seating and cocktail tables on a patio or by the pool with concrete or other building materials. These pieces are typically resistant to foul weather so they can be left out and used year-round. 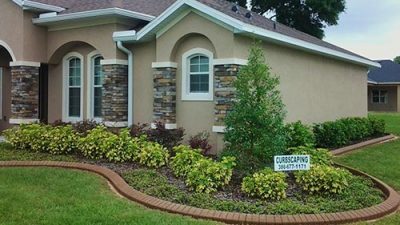 Create curbs that outline your current driveway to give it a manicured appearance, or resurface the entire driveway to create smooth terrain for any vehicles entering your property. Talk to curbing and surfacing professionals to determine the best materials for your driveway. Consider camouflaging uneven surfaces or failing grass with an aggregate surfacing; gravel, sand, and small rocks make a versatile surface that helps to level unpaved spaces. 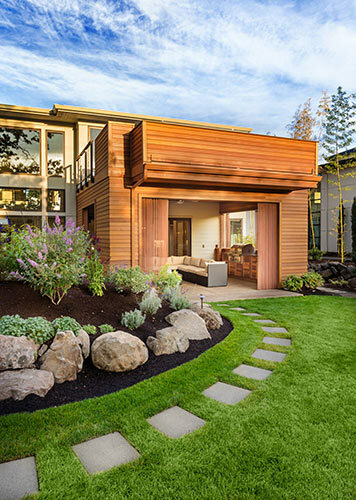 Aggregate materials are eco-friendly and bring a rustic, inviting vibe to your home’s curb appeal. Talk to paving or stone contractors about the different types and sizes of aggregate stone available for your hardscaping projects. Give your landscaping a personal touch with yard art; these pieces require little maintenance beyond routine cleaning or seasonal stowing. If you want to complement concrete hardscaping, choose cement figures, birdbaths, fountains, or containers to add visual interest to your yard without creating more work for yourself later on. Check thrift and antique stores for unique and vintage figurines that are cohesive with your landscape theme. If you struggle with access issues around your property due to the topography or terrain, steps are a prudent hardscape solution. You can use stone to create stairs that meld with the natural surroundings, or consider brick masonry for a more polished look. Choose a do-it-yourself approach, or contact a surfacing professional for a set of sturdy and resilient steps in your landscape. These hardscape suggestions are easy to maintain, requiring only repair or refurbishment if the surfacing becomes compromised or cracked. 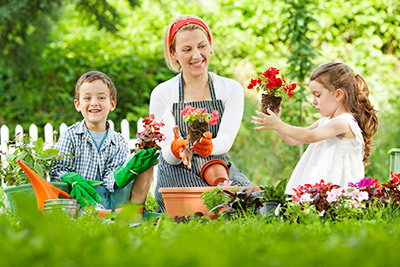 You may find that you spend far less time working in the yard and garden and more time enjoying your property. Talk to our surfacing experts here at Daytona Classic Curbs, Inc., to make some solid improvements to your landscape with hardscaping. Sprucing up your property hardscapes can add value to your property — without the work.